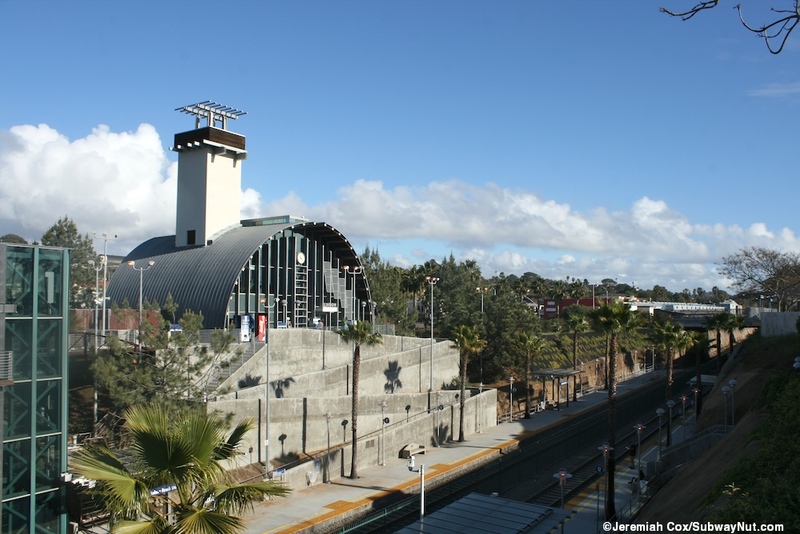 The Solana Beach station is a modern station which had the first Amtrak San Diegan trains stopping on February 6, 1995 although the depot itself wasn't completed until sometime after. 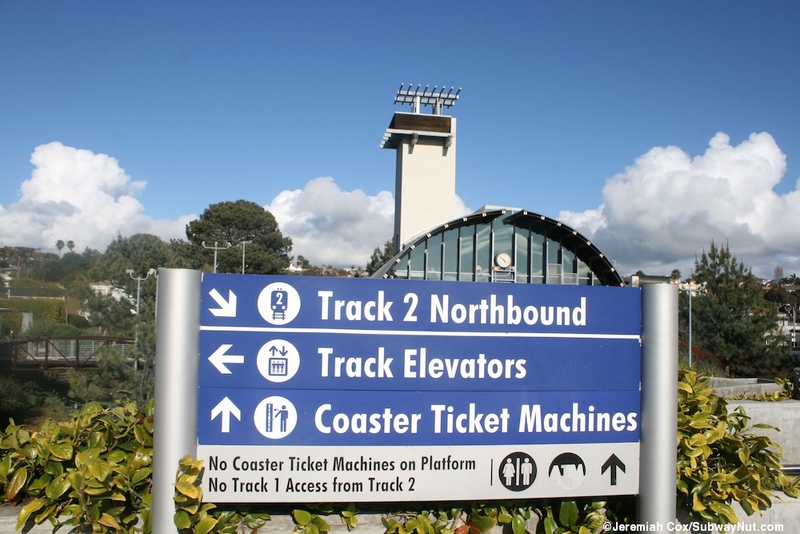 Coaster began operations at the station when it opened that same month of February 27, 1995. 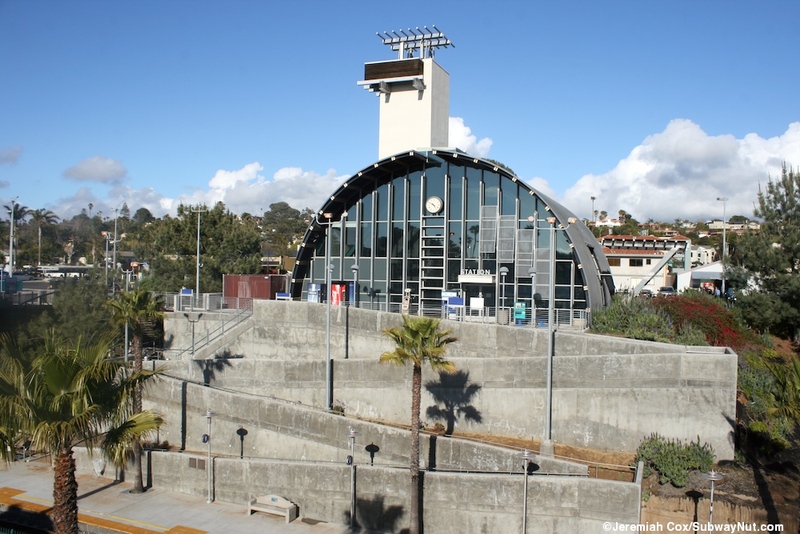 The station replaced the stop at the historic Del Mar Station, less than two miles south of today's station, which was served by train service since 1911 and saw it's last train the day before on February 5, 1995. 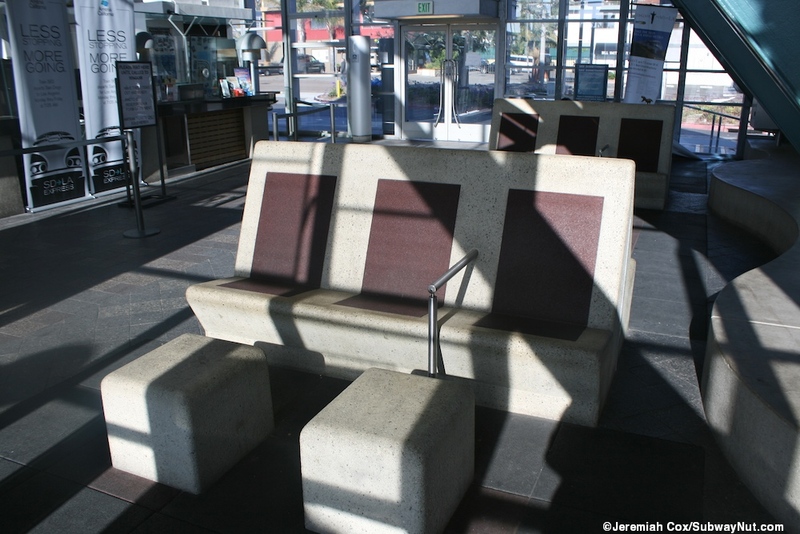 The main reason for Solana Beach replacing Del Mar was the former town's refusal to turn the station in a modern transportation center and a lack of parking spaces (only 95) at the previous depot (Google News Archive Search for Del Mar Solana Beach Amtrak). 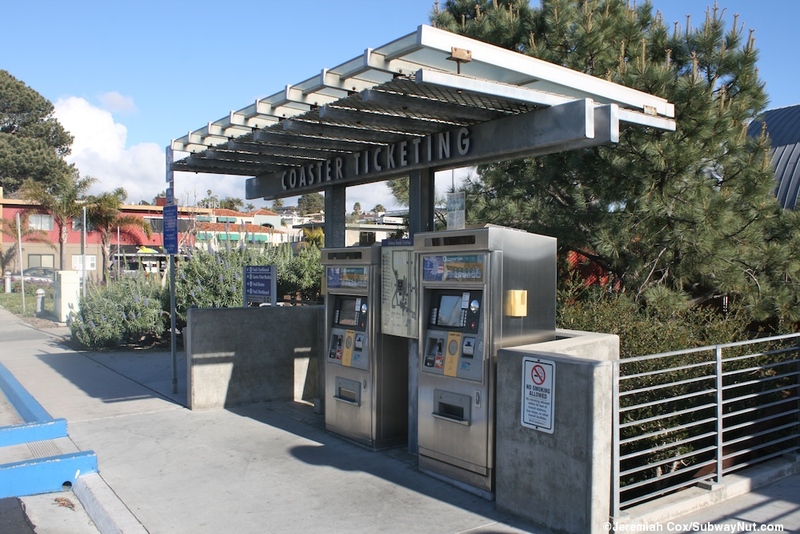 What Del Mar really wanted was to keep Amtrak service and the local tourism traffic it generated to the Seaside Community but not become a stop on the Commuter Oriented Coaster Line, with its requirements for commuter parking. 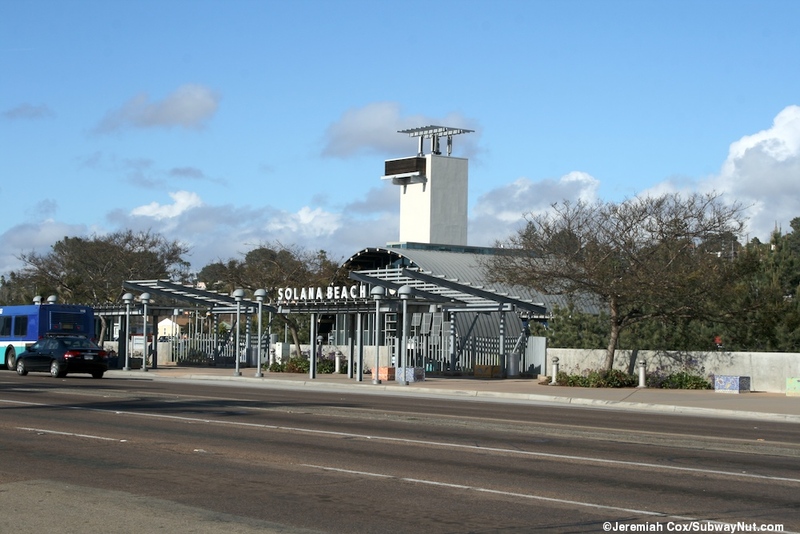 After years of controversy Amtrak decided to move to the modern Solana Beach Station instead which Amtrak claims has 250 parking spaces. 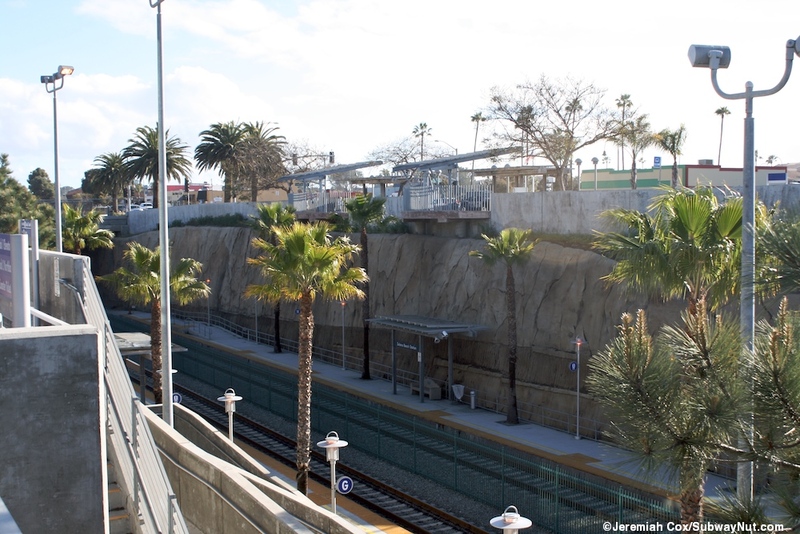 Campaigns have been mounted to restore service to Del Mar since then and the depot still exists (I did not know about it to visit it). 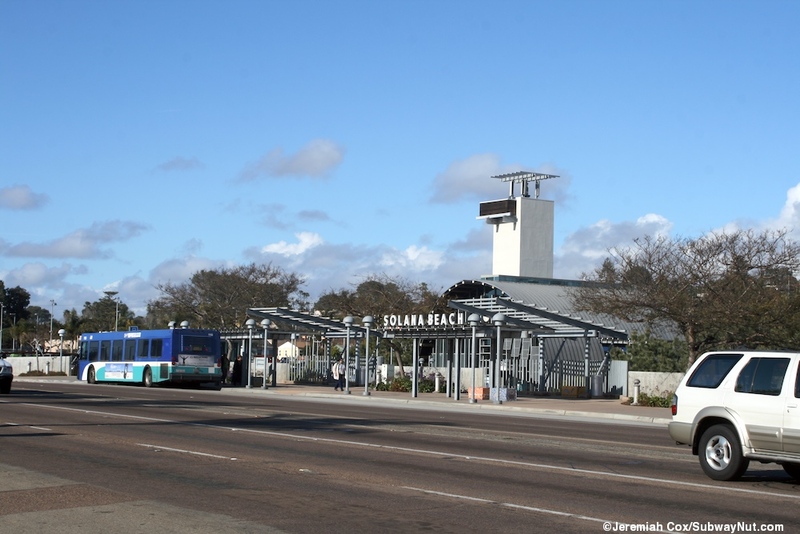 During racing season at the Del Mar Racetrack, 1 mile away (in 2012 from July 18 to September 5) shuttle service is run to and from the Solana Beach Station, Amtrak provides additional capacity and Metrolink has even been extended to the station to serve patrons. 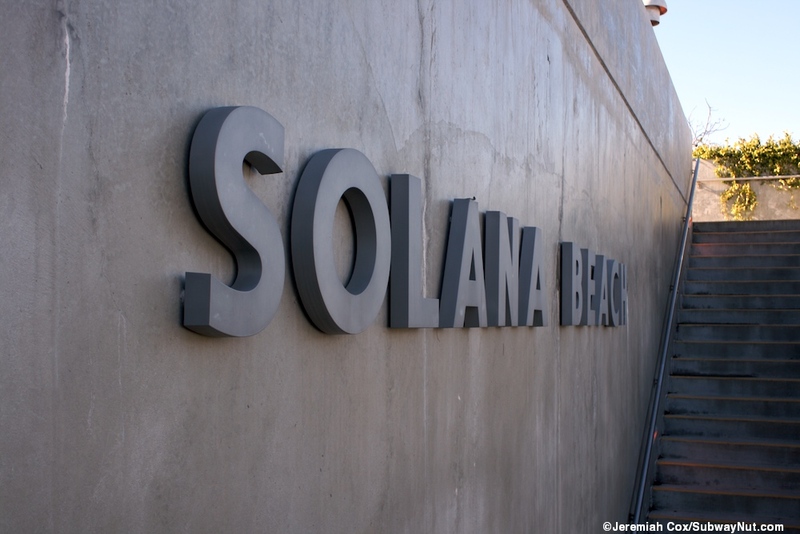 Solana Beach receives train service from the 11 daily Surfliner Trains, with checked baggage service for most, along with 11 weekday Coaster trips (13 on Fridays), 6 on Saturdays and 4 on Sundays. 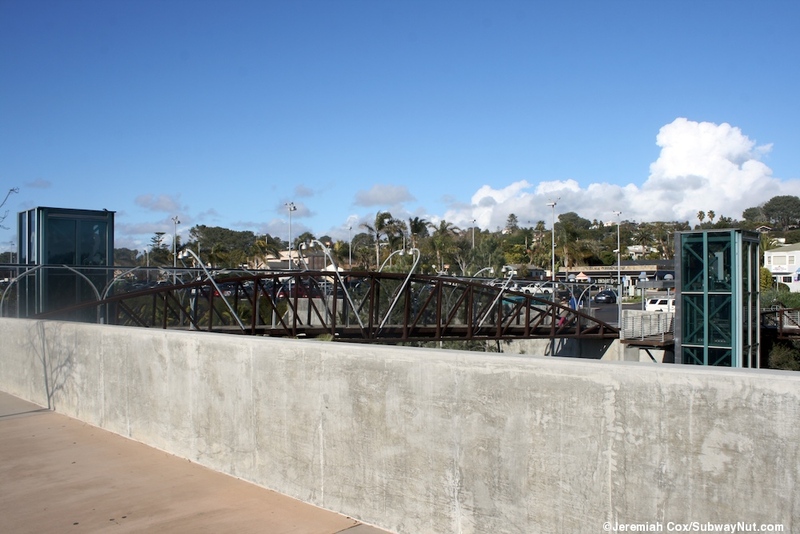 As part of the project to build the station the tracks were also lowered into a cut and cover trench and the line widened to two tracks to end traffic delays in the downtown of Solana Beach. 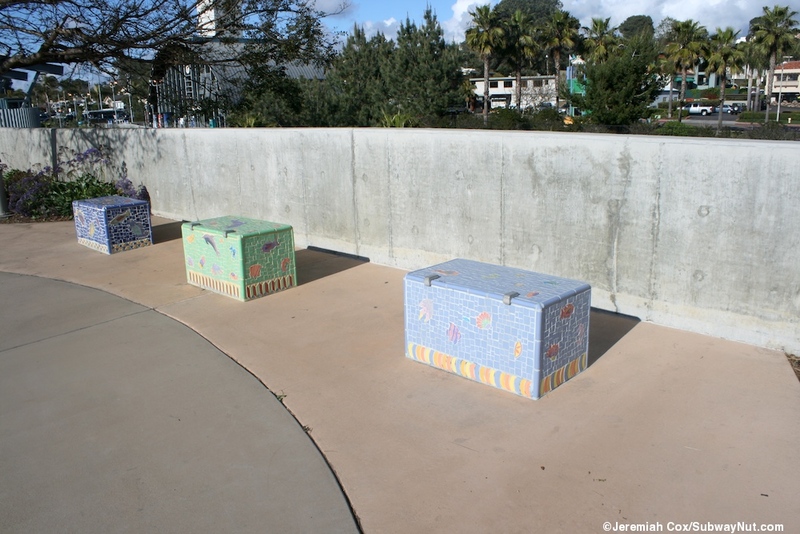 This cut and cover trench has walls that gradually slope down to the track level even planted in places with vegetation on the sides of the open-cut and palm trees line the modern two low-level side platforms with there tactile warning strips. 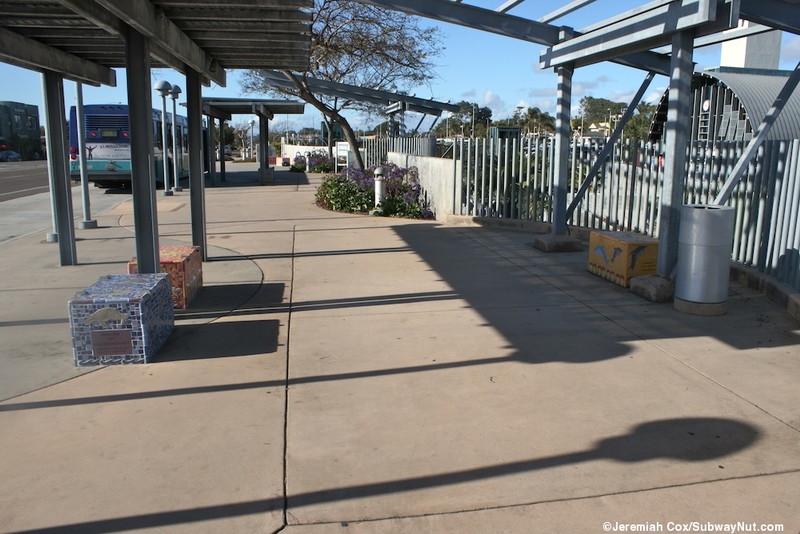 A fence runs between the platforms requiring passengers to enter the trench on the correct side needed for there train, although there is a grade crossing that can be opened for emergency use at the northern end of the platform. 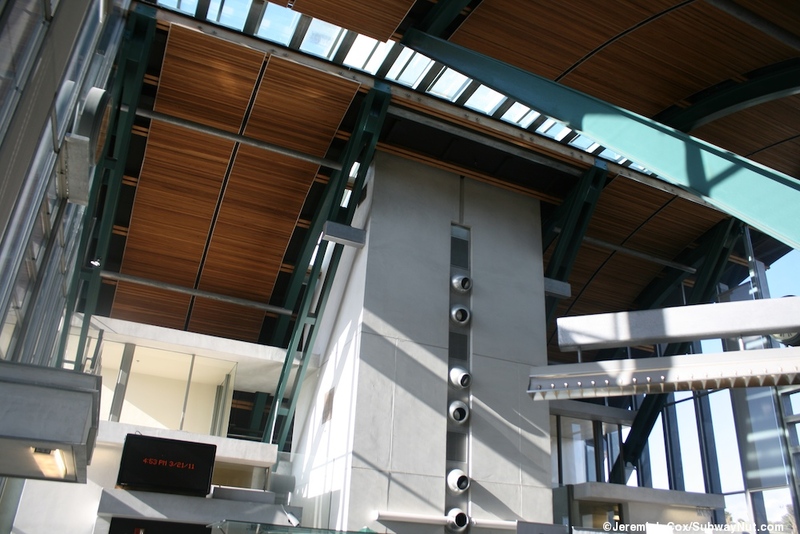 Each platform has four modern canopies with silver pillars holding up glass roofs. For ADA boarding there are mobile lifts left out in the open along each platform and Coaster's ADA mini-high platforms at its southern end. 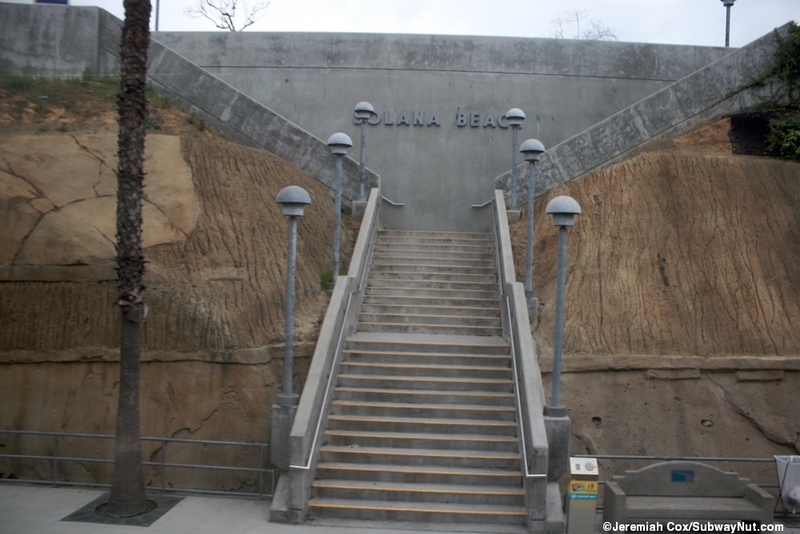 The platforms begin just north of where Lomas Santa Fe Drive passes over the trench. 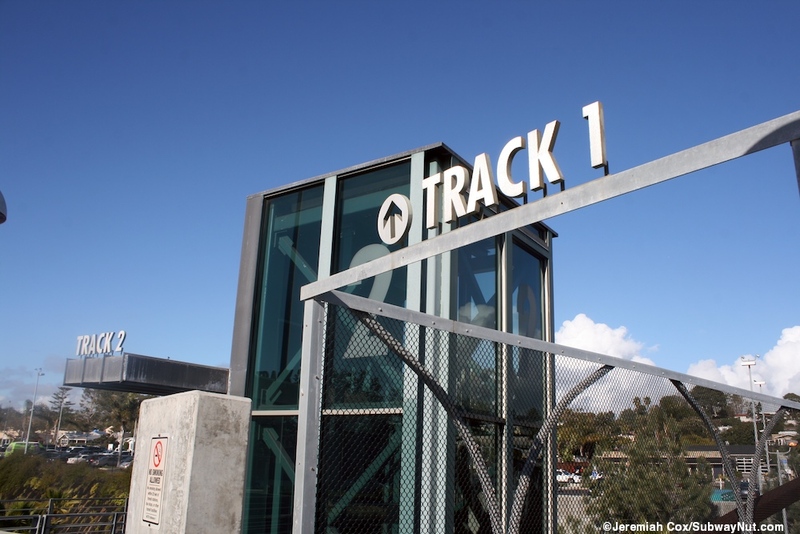 The west track, for northbound trains has Highway 101 just above the open cut. 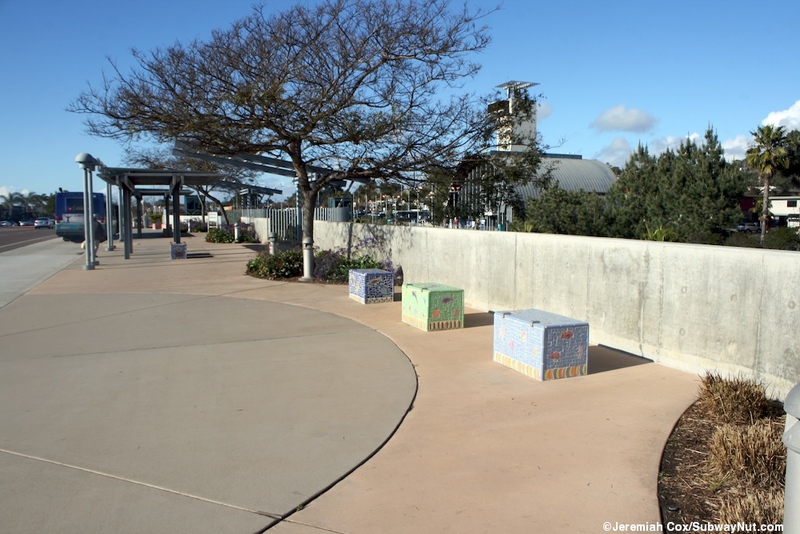 It's sidewalk has a few stops for connecting Breeze Bus Routes. 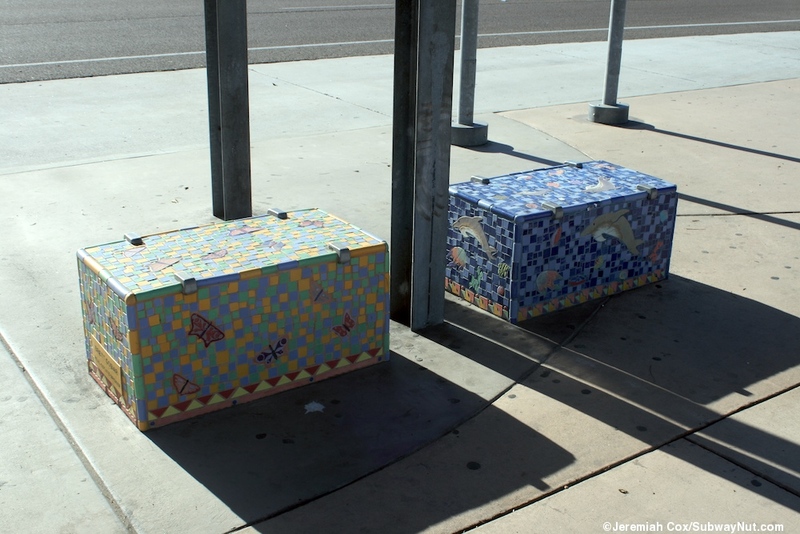 These bus stops have public artwork which are beches covered in mosaics tiled with scenes of the sea (City of Solana Beach Current Public Art Projects). Access to the platform is quite limited: there is a single staircase towards its southern end which comes from the sidewalk and branches into two separate staircases midway down towards the platform. There is an elevator in the middle of the platform alongside a pedestrian footbridge that is the main connection between the two platforms and sides of the open cut. 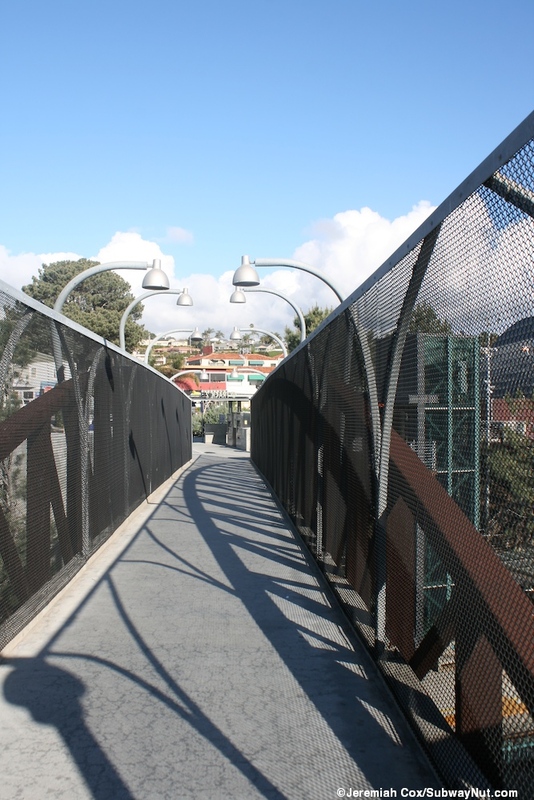 The pedestrian bridge directly connects to an elevator and is at the southern end of the crowded, long and narrow 250 space parking lot that extends way north of the actual platform, the opposite side of this parking lot is Cedros Avenue. This elevator provides some access to Southbound Track 1. A ramp also leads down from the overpass, this one has a super wide switchback, I assume to accommodate a baggage cart. 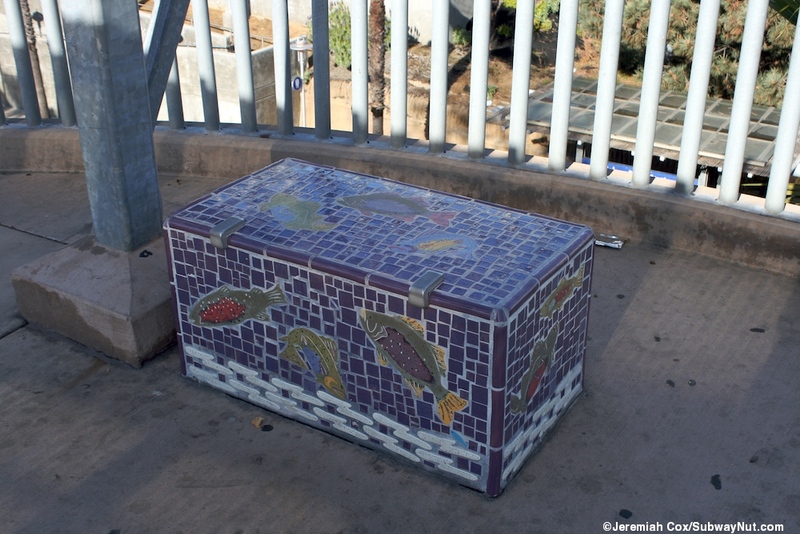 There is a staircase right next to it which goes beneath a sidewalk crossing on a little bridge to one branch of the overpass. Just south of here is the modern steel cylindrical walled depot. The north and south walls are made of steel which come together to form the roof (with a skylight in the middle between the sections) and other two sides made of glass where the entrances area. A central square tower rises up a bit above the single-story building with its high ceiling. 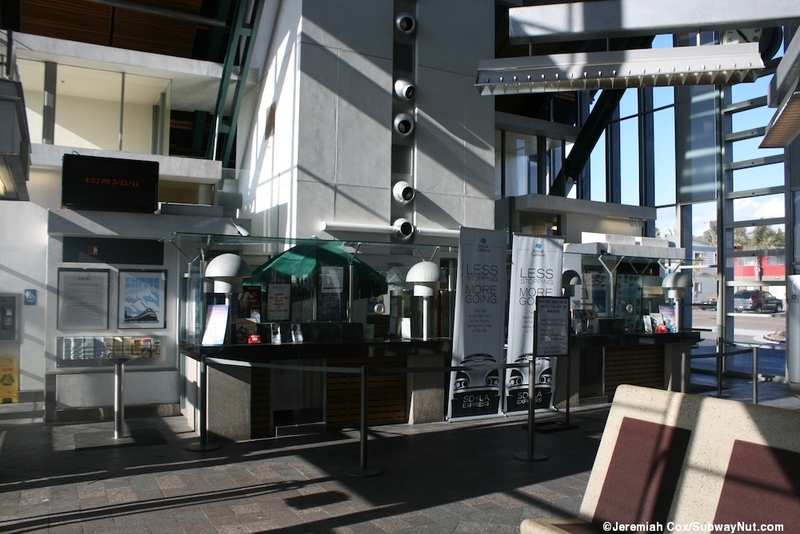 There is a modern, glass windowed ticket office where baggage check-in also occurs. Right outside of it is another ramp which uses two switchbacks to wend its way down to the platform.